September 15, 2012 from 1:00 pm to 3:00 pm. With the success of last years first annual Joey?s Hope event, where we welcomed special guest Council member Steven Neal from the 9th District, a representative from CA State Assembly member Isadore Hall III from the 52nd District, this year we plan to continue building our same mission restoring hope, smiles, and working with healthcare organizations to cover aquatic therapy for children on the autism spectrum. In 2009, Mieko decided to go public with her son's success with medical cannabis and was invited on FOX News, The Doctors Show, NBC, CBS, The Good Morning America's Today„s show, Australia?s number one morning show and ABC?s 20/20 . Mieko has become a source of inspiration for other mothers and families. She often mentions her own inspiration, Eunice Kennedy as one of her mentors and reasons for starting The Unconventional Foundation for Autism. Mieko is now sharing her son's story through mainstream media and has formed a non-profit organization dedicated to alternative autism treatments at UF4A.ORG. After her son Joey was denied this type of therapy, she decided to do something about it. The Unconventional Foundation for Autism has launched a campaign that will raise awareness on the growing number of special needs children being denied the proper treatment methods they desperately need. As Autism is at the forefront of the new healthcare coverage Bill SB946, this event will serve as a model outline for healthcare & regional center providers in building criteria for this type of therapy. Mieko and her foundation have placed their efforts to raise awareness and support for families with non-traditional therapies with Aquatic therapy being at the top of their list. The typical cost of an Aquatic Therapy on the average is between $65-$100.00 per session, as a parent dealing with the autism factor, we are finding our cost of living to surpass the current household income that was set in place before the rise of autism with the items parents need on a daily basis. Autism seems to be the new “golden child” of expenses as Mieko states… it's the hard knock life for us. Since our last “Joey?s Hope Aquatic Therapy Event” Mieko, has been the recipient of The Evelyn duPont Community Service Award and received a proclamation from Congress member Laura Richardson 37th District and Los Angeles City LA Supervisors Don Knabe for her participation in bringing more awareness to the Aquatic center. 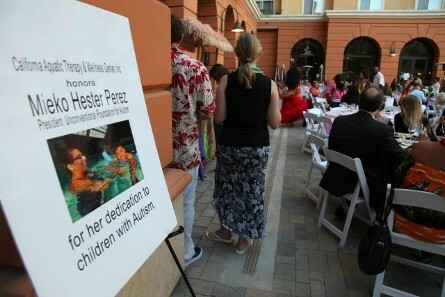 The Unconventional Foundation for Autism has partnered with The California Aquatic Therapy & Wellness Center, Inc., in Long Beach to allow families and children experience warm water therapy. Aquatic Therapy can promote wellness and improve the quality of life for individuals with health needs in an accessible, warm-water aquatic facility. 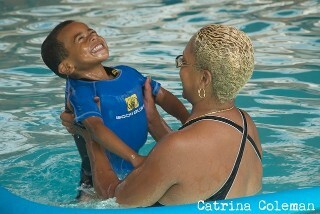 The Aquatic Center was founded to serve disabled children and has served physically and mentally compromised children for nearly half a century including those afflicted with cerebral palsy, Down syndrome, spina bifida, autism spectrum disorders, and other physical and developmental challenges. 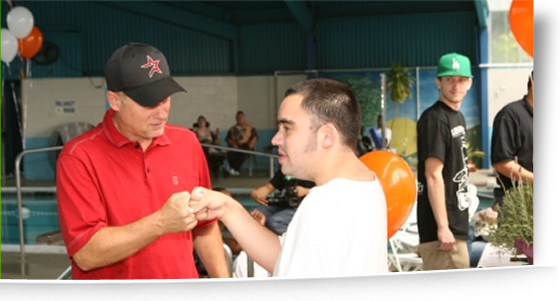 Since the inception over 45 years ago, The Aquatic Center has provided in excess of one million therapy sessions to improve the lives of children and adults with disabilities. Invited guests include Long Beach City officials & Medical Professionals from Kasier Permanente, CIGNA, Aetna, United Healthcare, Blue Cross / Blue Shield and Molina Healthcare organizations.